It only takes a Moment.... This beautiful book is full of ways to take just a Moment or two to wind down and think about the day that was - and the day that will dawn tomorrow. Share a Moment at the end of the day with your child. Listening and talking with your child sends a wonderful message of caring and love. And the simple practice of bringing a gentle, accepting attitude to the present moment can help minimize anxiety and increase happiness. 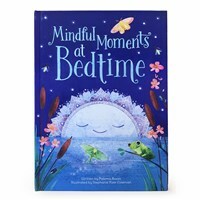 Inside this peaceful bedtime book are 12 Mindful Moments to share in a quiet and thoughtful way, before sailing away on the dreamship. • Think, talk, imagine and wish.... all the way to sweet dreams and a world full of love. • Thicker pages than a regular storybook to allow for reading over and over again without traditional wear and tear.